As one of India’s bestselling non-fiction authors, economist Sanjeev Sanyal probably wrote Life Over Two Beers and Other Stories as an antidote to a long-standing trend—the tendency to pass off only long-form novels and well-researched tomes as respectable work. It is a collection of 14 short stories and a few poems. His inspirations for this book are varied, though peppered with strong influences of P.G. Wodehouse (starting from the cover) and other satire writers like Ernest Hemingway. 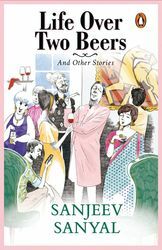 His stories draw heavily from real-life places and characters, which include a Mumbai housewife, a Delhi socialite, Singapore bond traders, NGO do-gooders and even pretentious journalists. Sanyal captures their emancipation, their world and even their flaws and pegs them all to recent incidents in the news. An urban theorist and known Marx critic, Sanyal also takes on long-held social beliefs and group dynamics—particularly those in the city of his origin, Kolkata. Single men feature as the central character in most of his stories. Some like ‘The Troll’ and ‘Conference Call’ dive deep to explore the impact of technology on our lives. Sanyal had started this work of fiction well before joining the government, intending to fill a void left by satire writers like R.K. Narayan and Anita Desai. “No equivalent writer had emerged in our times,” said Sanyal. Life Over Two Beers and Other Stories could be your perfect companion on that trip to places where there is no cellular network.